Words about farmers markets, gardening, place, and whatever else seems relevant to my little life now being lived in the metropolis of Tokyo. Two of seven cardboard 'beds' in place. As readers may have noticed, in March we moved house. We left Tokyo for the wilds of Kanagawa Prefecture and new jobs at a new university. My husband's five-year contract limit had been reached, so we bade farewell to wonderful friends in a beloved place to strike out again on our own. We have landed once more in university housing with plenty of farms and orchards all around. While I won't be wheedling my way onto a local farm this year (writing and a new teaching job are keeping me plenty busy!) I have started a garden and flower pots are starting to fill balconies and verandas. Unlike my Tokyo garden, this one is not on a farm. It is, instead, in a small park-like space behind our building. Once well-used and well-tended, the space when we first saw it late last year was full of weeds, moldy furniture, and unpruned shrubs. The manager said I could do whatever I liked there, and so the thinking and planning began. I've decided to follow my own advice to other growers, which is to start small. I've also opted to try and be as noninvasive as possible. I've had the pleasure of reading a number of terrific books these past few years for pleasure as well as for review, and one of the things each instilled in me is an ever increasing respect for the soil. Tilling, chemical fertilizers and pesticides, and mono-cropping are no way to take care of it and the community that resides in it. My plan, therefore is to return to a method that works well and creates good soil as well as good vegetables: lasagna gardening. But with a twist: lasagna gardening in cardboard. Taking a bit of inspiration from Amber over at The Cardboard Collective and her most awesome cardboard garden, I gathered together a handful of similarly sized boxes left from our recent move and took them down to the garden. Taking a few hints from Juliet Kemp and other permaculturists, I positioned them in good light, but out of the way of folks who might want to use the space for a picnic or a bit of afternoon fun. (We have cleaned the garden up considerably, so there's plenty of room now to play, nap and barbecue.) I filled the boxes with compost from the three bins left by previous residents, alternating the layers with the dried stalks of various grasses and weeds cut down during the great tidy. Cinder blocks and some landscaping bricks that had been lying about got set along the outer edges of the boxes as additional support. My fear was that the boxes would melt in the rainy season while my plants were still in them. Under the cinder blocks I placed the cut off flaps of the boxes as a weed deterrent. More dried stalks and grass got laid on top as mulch. Then I watered whether they had been planted in already or not. 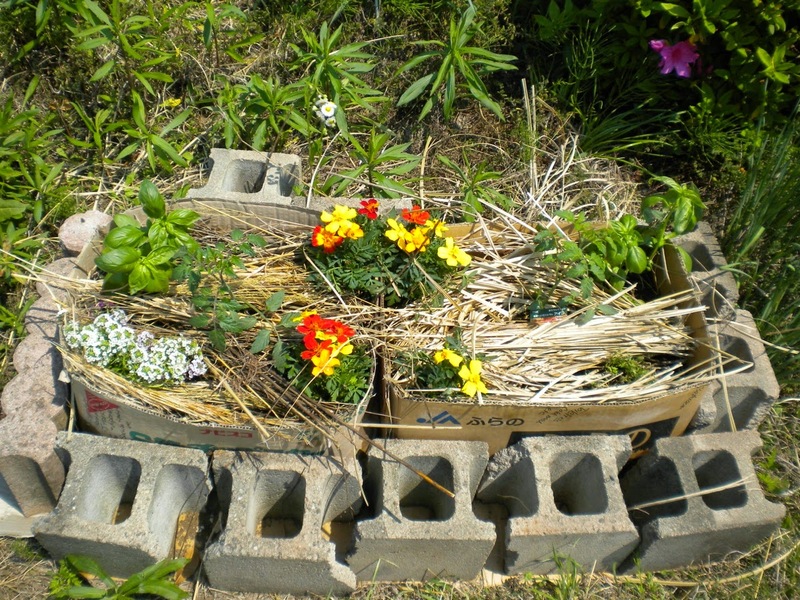 Once the cardboard does fade away, a nice bed of rich soil will be left behind. So far, so good! Writing about food, farming, and farmers markets in Tokyo and beyond.